For most of 2017 the Irish peace process has been in crisis and the northern assembly collapsed. There are frantic calls for restoration and both Sinn Fein and the DUP proclaim that their one desire is to agree a new executive. Yet the most recent example of sectarianism, where four Catholic families were expelled from Cantrell Close, an area specifically constructed as an area free from sectarian division, both explains why the peace process isn’t working and explains why it would be better to wind it up. The banner of the process was “equality of the two traditions” and it was argued that the policy would lead to a gradual lowering of sectarian tensions and lead to a normal democratic state. As part of the new ideology the new assembly funded the construction of two shared housing schemes in south Belfast that would encourage Catholic and Protestant families to live together. In reality most people need little encouragement – housing outside ghetto areas is at a premium. Only a constant background intimidation from loyalist paramilitaries and state collusion with that intimidation keeps housing apartheid in place. The idyll of shared housing received a sharp shock following the 2017 Westminster election, when UVF flags went up in the area. No one believes the blather of “Protestant culture.” The flags were seen immediately as a challenge to the idea of shared housing, as a territorial claim by the paramilitaries and as a threat to the inhabitants. After all, the Protestant families there had supported shared housing and could be treated as traitors, equally despised with their Catholic neighbours. The 2017 Westminster election was one of the most sectarian ever. The DUP vote had fallen to just above that of Sinn Fein and they responded with a call for Protestant unity and a promise to tear up the power sharing agreement if the unionist position came under threat. 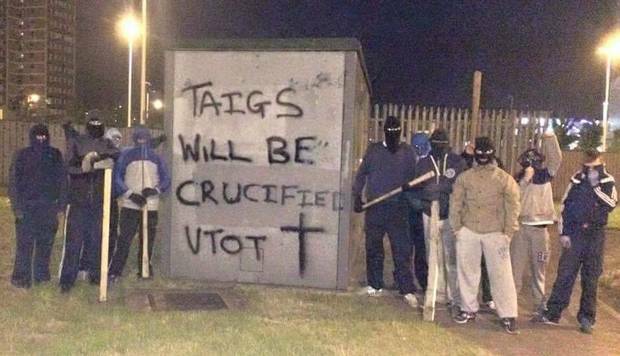 To underline their message they called out the loyalist paramilitary groups as part of their election team. One of the gains of this strategy was the South Belfast seat, won by Emma Little-Pengelly. She had been known as Emma Pengelly before the election, but the addition of Little reminded bigots that her father had been a loyalist gun-runner. Pengelly was one of the architects of the Social Investment fund (SIF) used by the DUP to funnel £17 million in “community” funds to the Ulster Defence Association (UDA), an illegal (and still active) paramilitary group. One of her first acts on election was to tour the shared areas under threat and ask residents for their views. This is rather like Al Capone touring Chicago bars to find out if they minded paying a small sum to the mob for protection. The results of the u-official survey, according to Pengelly, was that no one wanted a public fuss. She also observed that “flags that went up would also come down.” They were not removed until after the expulsion of Catholics—and even then the mechanism was talking the UVF around to removing them themselves. Their removal was followed by an impromptu Orange march in the area to remind everyone that it is now Loyalist territory. The loyalist paramilitaries have never been able to garner significant support. They are, however, made much more virulent by the long-standing sponsorship of the DUP. That virulence gains one thousandfold when we add in the level of impunity afforded by the police and the silence acceptance and silence of the mass of civic society. The police have evolved a unique policy. Loyalist intimidation is a cultural issue and a matter for community discussion and not for the law. In practice this means that loyalist flags and emblems are untouchable and the only way to remove them is to bribe the loyalists (who rarely stay bribed). At Cantrell Close the police role was to arrive at the homes of the Catholic families shortly before midnight, tell them they were under threat, and leave again. Not surprisingly, the families fled. As one Sinn Fein member bitterly commented, the police spent £25 million protecting a derelict caravan during the Twaddell Avenue Orange protests and were unable to find the resources to protect these families. They then claimed that they were unable to identify the source of the threat, even though it was detailed enough to justify issuing a warning and even though the estate is bedecked in Ulster Volunteer Force flags. Finally they claimed that the UVF was disorganized and this made it difficult to gather information! One should not forget the local media. Most incidents of intimidation are not reported. When they are the word “loyalist” is usually avoided. As in this case, the story quickly drops off the news agenda. In fact paramilitary eviction is an almost daily occurrence. Housing authorities plan to “solve” the problem by removing the extra housing points awarded to those forced out. The main protests come from Sinn Fein. They however are a broken reed, having helped set up and operate the social investment fund that bankrolled the loyalist paramilitaries in return for their own share of the slush fund. The Cantrell Close situation is unusual in that there were public protests by the victims of the intimidation and their allies, but the evictions serve to show up their isolation. Like a set of Russian dolls, the loyalists are embedded in layers of impunity and collusion, with the structures of political and civic society silently averting their eyes. The idea of a peaceful, democratic and nonsectarian future held out in the Good Friday Agreement has turned out to be a chimera. The Cantrell Close project was a practical experiment to show that society in operation. All the participants, both Catholic and Protestant, have been betrayed and now live in a climate of fear. This local failure is reflected in the ongoing failure of the local assembly. All the parties and the British and Irish governments are struggling to revive it. Yet its revival will not lead to a new Northern Ireland but to something very like the utterly corrupt and sectarian Northern Ireland of the 1950s. 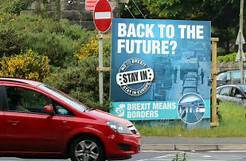 The Irish border was an issue that came up repeatedly during the Brexit referendum as an example of the difficulties that would arise from a British withdrawal from the EU. The stock response of the Brexiteers was to dismiss such difficulties, pointing to the pre-existing Common Travel Area as a means to manage move-ment of people and the establishment of bi-lateral agreement between the two states to regulate trade. What they omitted is that such arrangements only operate at present because both states are members of the EU. How can this situation continue when one state is no longer a member? Over a year on from the referendum vote – and despite repeated assertions of their desire for a “seamless and frictionless” border – the British government are no closer to providing an answer. This is clear from the position paper on the Irish border that was produced in August which was once again big on aspiration but containing a set of proposals that bore no relation to the real practical problems presented. In this it is consistent with the British government’s “have cake and eat it” approach to the broader Brexit negotiations of making demands and then passing off the responsibility for their implementation to other parties. These British proposals on the border have two main elements. The first is a bilateral trade agreement between Britain and Ireland that would maintain the regulations of the single market and customs union. The second is an agreement on the free movement of people within the island of Ireland and between Ireland and Britain. The claim for these arrangements is that they would maintain the status quo and eliminate the need for customs barriers or immigration controls. The glaring contradiction in this is the promise that nothing will change despite everything changing. If that really is the case what is the point of Brexit? On face value the proposals for the Irish border undermine the proposition that leaving the EU will enable Britain to devise its own trade and immigration policies. The problem is that there is no version of Brexit that can accom-modate these contradictions. If Britain wants to make trade deals with other countries after Brexit the regulatory regimes in the north and south of Ireland will inevitability diverge. Also, any new controls on migration will mean an end to free movement. With anti-immigrant sentiment being such a big element of the leave vote how could Britain operate an open border in Ireland? This proposal has already come under attack from the most right-wing elements in Britain – such as former UKIP leader Nigel Farage and the Open Britain Group – for allegedly creating a “back door” for immigration. There are also many practical problems with the British proposals on the border. Great store is put on technology but it is doubtful that an economic border can be regulated solely through digital means. There will have to be some physical presence which will involve designated crossing points for freight and some vehicle checks. They may not be called border posts but that is what in effect they will be. Even without a physical presence the additional costs of moving goods from one customs regime to another is in itself a hardening of the border. The alternative – and what Britain seems to be proposing – is that the EU ceases to uphold its regulations and allow a free for all across the Irish border. Yet this has already been rejected by the EU. Any hardening of the economic border in Ireland will have a negative impact in terms of additional costs and disruption. Currently indigenous Irish companies export forty per cent of their goods and services to Britain, with Northern companies exporting a similar proportion to the South and other EU states. Any tariffs or restrictions on these would have a very negative effects on the Irish economy. Another threat posed to Irish exporters is the potential loss of market share as a consequence of Britain entering into trade agreements with other countries. For example, a trade deal with the US – that covered food and drink – could have a devastating impact on Ireland’s important agrifood sector. The out-workings of Brexit will certainly lead to a hardening of the border in terms of trade and migration. For Irish workers – the resulting combination of depressed economic growth and restrictions on freedom of movement – will be very negative. The weakness of the Irish state in relation to the Brexit negotia-tions is reflected in the low priority given to the matters relating to Ireland. The British government has completely disregarded the negative impact its proposals will have upon Ireland. For the EU, the Irish border question is just one of a range of issues it will deploy in negotiations to ensure its survival as a political and economic bloc after a British withdrawal. Indeed, this was made very clear by chief negotiator Michel Barnier in his address to the Dail, in which he said that the overriding priority in relation to the Irish border was the assertion of EU rules and regulations. This position was asserted again by Barnier in his dismissal of the British proposals for the border. The positions being adopted by Britain and the EU leave only two rational outcomes for Ireland if Brexit goes ahead. Either a hard border is established in Ireland between the northern and southern states (as part of the a border between the EU and Britain) or else a border is put around the whole island of Ireland and between it and Britain (effectively making the Irish Sea the dividing line between the two land masses). However, given the rejection of the second option by the British – and the furious reaction to it from the unionists – politically the first option is the only one. The position of the Irish government was revealed by the speed at which it sought to distance itself from the proposal for a sea border. Of course this is totally in keeping with the aversion of the Irish political class to anything that would point towards a united Ireland. Even though unification would resolve issues relating to trade and free movement within the island it is trumped by the need to maintain the foundation of capitalist rule that is partition. This is why Irish nationalism – from Fine Gael to Sinn Fein – has coalesced around the proposal for special status for Northern Ireland; an arrangement that would minimise economic barriers while keeping the political border firmly in place. Yet, even this modest proposal has been rejected by the British. Despite the rhetoric about being selfish over Ireland’s interests and not designing a border for the Brixeteers the Irish state has been left on the margins. When pressed about their position Irish political leaders fall back on the hope that Brexit won’t happen. The idea that they are influencing the negotiations or helping to shape their outcome is an illusion. That will be determined by the interests of the EU and Britain. If Brexit has exposed the absolute weakness of the Irish state it has also revealed the relative decline of Britain. While still an imperialist power its weight in the world is not what it once was. In the negotiations Britain is clearly the weaker partner whose demands have been rebuffed by the EU. The idea, pushed by the most right wing elements within the Conservative party, that Britain could dictate terms, has proven to be delusional. This is also the case for their vision of post Brexit Britain as a global trading power. While Britain may be able to make trade deals outside of the EU they are unlikely to be on favourable terms. We can see this in the outline of the proposed deal with the US that would see the dismantling of regulations and the dumping of cheap food (chlorine washed poultry, hormone fed beef, and genetically modified crops etc) onto the British market. Britain, outside of the EU, would be in a weaker position in any future trade negotiations. Rather than dictating terms it would be forced to accept the demands of other states and trading blocs that possessed greater economic weight. The protectionist moves by the Boeing aircraft company against Bombardier are similar to measures advanced by the US 20 years ago and beaten off by the combined forces of Europe. Now all Theresa May has is a handshake with the con artist Trump. This “Hard Brexit” is an allusion, but no less so than the so called “Soft Brexit” that would allow Britain to retain the elements of EU membership (such as access to the single market) that are seen as beneficial. Again the assumption that is that the EU will accede to British demands. But this cannot happen. The EU, for its own preservation, must ensure that Britain is in a worse position when it ceases to be a member of the bloc. If it wasn’t what would prevent other states leaving? In this situation the choice isn’t between a hard or soft Brexit, for no such distinction exists, but between Brexit and No Brexit. Opposing Brexit does not mean supporting the EU or having illusions that it can be a vehicle for reform. The EU is a thoroughly pro capitalist bloc. In the most recent period it has used the financial crisis and accompanying bail outs to impose vicious austerity on states such as Ireland and Greece. Over the longer historical period it can be viewed as an attempt to integrate Europe both economically and politically in the interests of capital. The vote for Brexit and the rise of nationalism and xenophobia within the bloc show that this attempt is failing. However, that does not mean that socialists should tail end this backlash by adapting to demands for economic nationalism or protections for workers on the basis of their nationality. The consequence of such policies would be to cause conflicts both between nations and within the working class, and to bind workers to the interests of their own capitalist class. Such policies are also reactionary in the broad sense of being part of a doomed effort to reverse long estab-lished historical developments. The delusional nature of this can be seen in the harking back to empire that underpins the programme of the Brexiteers. It also finds an echo in the promise of Trumpism to Make America Great Again. Rather than attempt to turn back the clock to a period when national economies and nation states were dominant socialists look to a future of greater integration between states and economies. This is not because we have illusions in capitalism but because we understand, as Marxists of an earlier period understood, that such developments are not only already ongoing but also tending towards greater unity amongst the working classes and more favourable conditions for the transition to socialism. At the same time we recognise that this not inevitable but can only come about through revolutionary action. In Britain the labour movement needs to be at the forefront in opposing Brexit. This cannot be left to Liberals and Tories or lobbyists for business. One of the main tasks of this campaign – that will clearly define it as being of the left – will be to challenge the anti-immigrant sentiment that fuelled much of the Brexit vote. Migrant workers must be seen as fully part of the working class and their rights defended as part of a broader defence of workers’ rights. The idea that migrant workers are separate or some external threat to wages and working conditions (a false proposition that some trade union leaders have indulged) must be rejected. A pro-labour campaign against Brexit will likely emerge from the trade unions and Labour party. Indeed, with the recent shift in Labour party policy and the establishment of groups such as the Labour Campaign for Free Movement, it is clear that this process is already underway. As the bleak reality of Brexit comes into view this is likely to strengthen. While the potential negative impact of Brexit is even greater for the Irish working class than for the British most of the Irish left continue to be fully supportive of a Brexit position and propose a similar path (Irexit) for Ireland. Conscious of the unpopularity of such a position they try to muddy the waters by saying they are opposed to a “Tory led Brexit” and by holding out the prospect of a “progressive” and “people led” alternative. But this “peoples Brexit” is every bit as illusionary as the soft Brexit. Populist rhetoric cannot disguise the thoroughly reactionary character of process that can only be driven by the most right wing elements in society. Another weakness of the response of the Irish left is to completely ignore the issue of the border. Despite the prominence of the issue within the Brexit negotiations no demands are made in regard to this. In Britain and Ireland many of the tasks in opposing Brexit will be similar – particularly in regard to the defence of migrant workers and the rights of workers more generally. For example, socialists should oppose any measures that would restrict the movement of people within Ireland or between Ireland and Britain. However, in Ireland, unlike in Britain, the democratic tasks are incomplete and the right of self-determination remains an issue. This cannot be dismissed as a nationalist concern – the fact that none of the nationalist parties take it up demonstrates that it is not. Rather the question of self-determination is central to the creation of the unified and independent workers move-ment in Ireland that can bring about revolutionary change. Workers’ rights and democratic rights are therefore inseparable. Indeed, it is the assertion of these rights that will be the most powerful counter to the reaction unleashed by Brexit.